UAE-based Unique Group has launched a new cloud-based planned maintenance system to help companies in the diving market sector effectively manage their equipment and adhere to certification guidelines and rules – simply and efficiently. Unique Group is one of the world’s most prominent integrated subsea and offshore solution providers. The system provides real-time overview of the equipment status helping achieve compliance and cost effectiveness in our client’s day to day operations, said a statement. 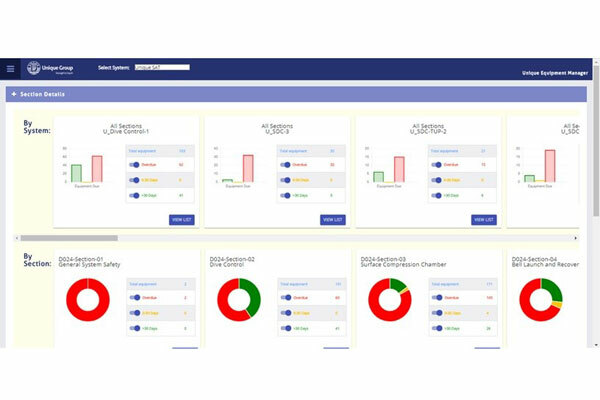 This asset management and maintenance system provides documentation for original equipment manufacturer (OEM) and International Marine Contractors Association (IMCA) compliant audit purposes, it said. It is fully portable and can be implemented across multiple geographies ensuring that our clients have a quick reference and alert system for managing the certification. Unique Equipment Manager helps reduce the administrative burden on your technicians by maintaining equipment details as per current guidance, it added.